Apple enthusiasts who are very particular on desktop cleanliness should check out this unique device designed specifically for Apple iMacs. 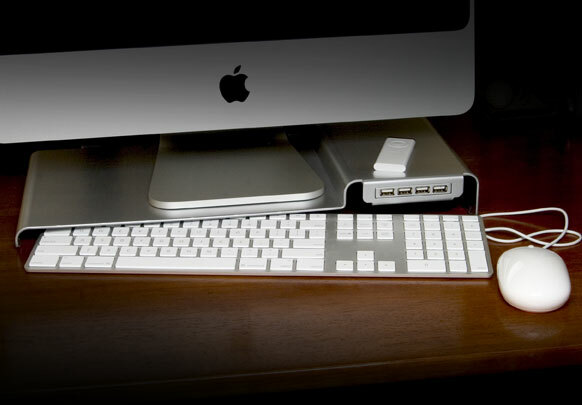 The LowKey Stand, a 0.1085-inch thick and power-coated steel stand from Macessity spreads out the entire length of the slim keyboard and is 9″ deep, creating a sturdy structure to support any size of Apple Cinema Display or Apple iMac. 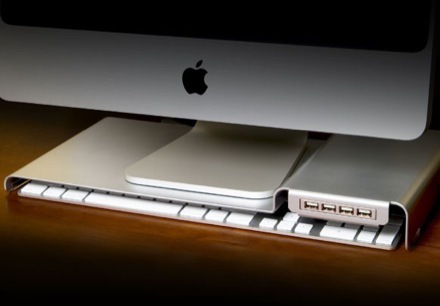 The steel structure also features a built-in 4-port USB hub for users to hook it up with their computer. Priced at $60, it might sound a bit luxurious, but if working space is always limited and tidiness is something that matters to you, perhaps you should get your hands on this Macessity LowKey Stand.